Designed by Sir Norman Foster of Foster + Partners, the Mriya Resort and Spa in Yalta, Ukraine is the very picture of glamour and extravagance. The resort houses approximately 422 lavishly designed properties, including 12 family villas and two presidential ones, all of which boast an elegant and contemporary aesthetic. Each suite at the resort offers visitors fantastic views of the Black Sea and the Crimean peninsula’s stunning scenery. 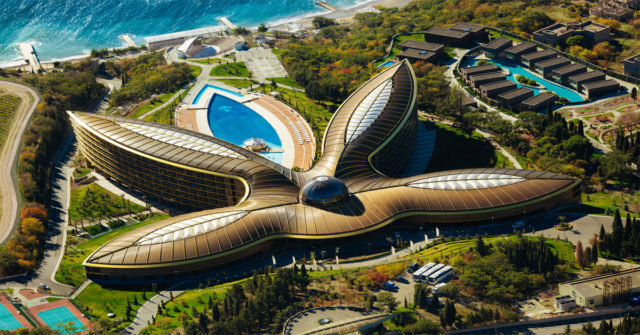 The Mriya Resort and Spa is recognizable by its unique exterior design, as it takes on the appearance of lotus petals, a lovely display that suits the resort’s alluring appearance. In order to help enhance the project’s impressive exterior, a coating system that utilized Lumiflon FEVE resin technology was used to coat the building’s roof and parts of its façade. The bronze-hued coatings applied onto the building’s exterior, which were provided by Monopol Colors AG, directly contributed to Mriya Resort’s posh design. Coatings that employ Lumiflon FEVE resin technology come with a plethora of benefits. FEVE-based fluoropolymers are well known for their outstanding durability properties in addition to their excellent color and gloss retention capabilities. Ideal for high exposure projects, Lumiflon-enhanced coatings have the ability to withstand UV radiation, water, salt, and other elemental deterrents for extended periods of time without sacrificing the structural integrity of the coating or the building’s overall aesthetic.